Add a splash of color to your next party with this Creative Converting 28312231 10" Burgundy plastic plate! 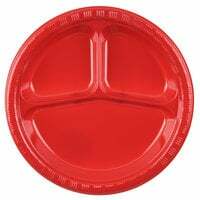 Perfect for any picnic, party, banquet, or festive catered event, this Creative Converting 28312231 plastic plate provides convenient service with a touch of colorful personality. 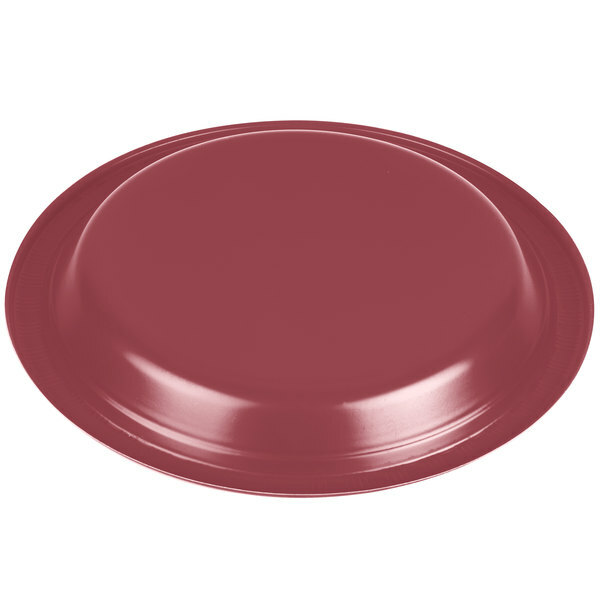 Plus, its large 10 1/4" diameter allows your guests to enjoy all their favorite party foods, such as salads, burgers, hot dogs, sandwiches, and more! "We bought these for a dinner that we were having for my church. They were very strong and performed well. we also liked the color. I was very happy with this product and the quality." Polystyrene plastic construction is durable and strong enough for holding heavier meals, or even just that extra helping of potato salad. In addition to making the plate easy to hold, a patterned design along the rim complements your food for a memorable presentation. 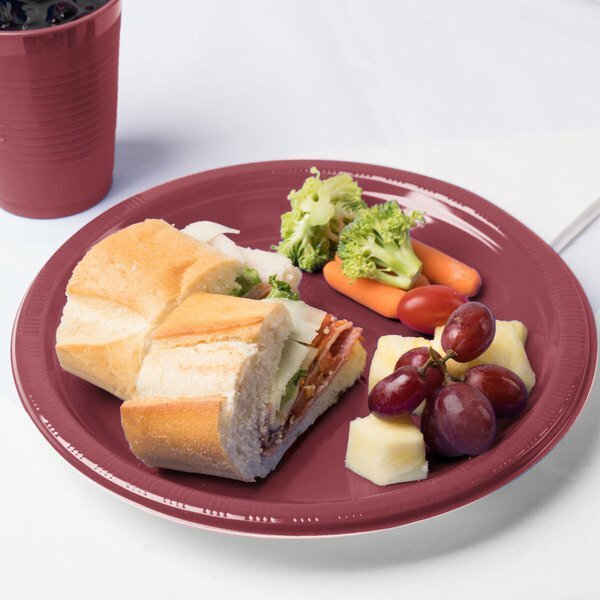 The disposable design of this plate makes cleaning up after an event or busy dinner service a breeze. 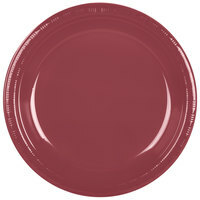 The vibrant, eye-catching color of this plate helps create a fresh and clean look. Plus, users can easily mix and match this product with other unique Creative Converting disposable colors to complement your event's theme, decor, and one-of-a-kind style. Purchased these plates for a wedding dinner. 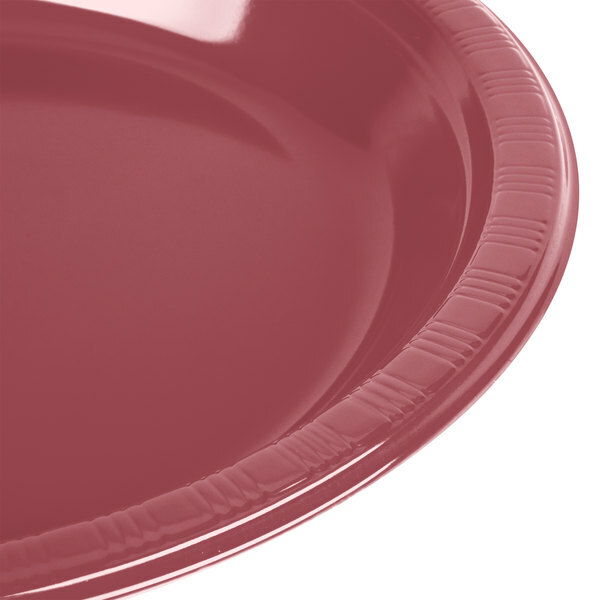 The plates are a very strong, durable plastic. . .nothing leaks through or spills. The sides are nice a deep so food doesn't slip or spill over. We bought these for a dinner that we were having for my church. They were very strong and performed well. we also liked the color. I was very happy with this product and the quality.